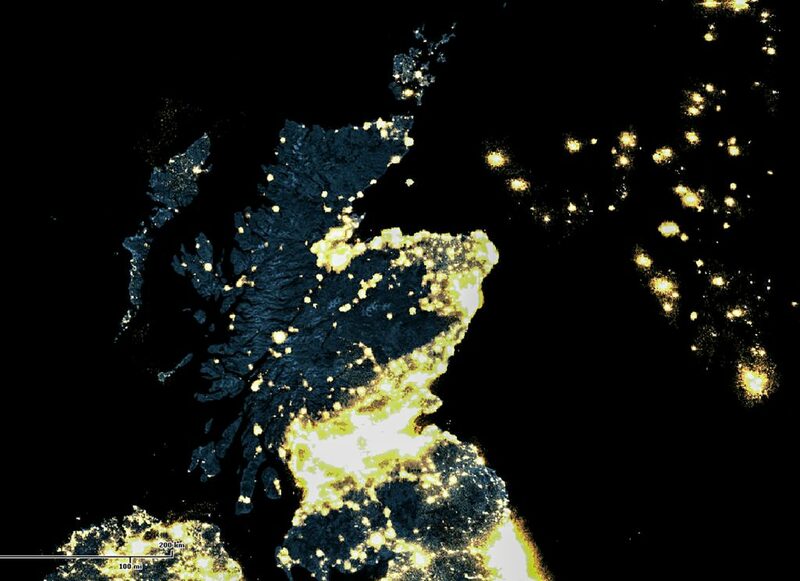 Scotland at night, much of the darkness owned by the few who own most of Scotland. Prompted by a twitter chat about Pete Kravitz’ seminal ‘Book of Contemporary Scottish Fiction’ I locate my copy on the dusty analogue bookcase, recently installed in my 58°0′N hideaway. I now live, play and work at the same latitude as Russia’s Kamchatka Peninsula to my East and Alaska’s Raspberry Island to my West. I suspect our microclimates and frustrations are all too similar. I locate the phrase that’s been annoyingly just out of grasp to fingers, tongue, and mind. Near the end of the introduction I find it. Pete Kravitz edited his book for Picador back in 1997, the year that saw Scots vote overwhelmingly in support of the devolved Holyrood Parliament. It was a time of fresh thinking, aspirations and hopes that finally the flaws and Londoncentric thinking that had blighted the rest of the UK and Scotland in particular, was coming to an end and that Scotland could get on with the business of being responsible for making her own mistakes – herself. I met some of the descendants of the cleared people last summer, whilst working in one of the Visitor Centres that used to be considered vital to the rural economy, well that is before Visit Scotland reckoned they could be replaced with a cheery thumb’s up post on Instagram. These returnees foreign by accent, but familiar in names and faces were looking for connections to land, places, stories and their lost history. Many of them want to come back, but like many of their less travelled compatriots they look on the survivalist economy and dreams sharply dissolve. Since Holyrood’s democratic mea culpa, we’ve seen the Abolition of Feudal Tenure, the Community Empowerment Act in 2015 and two land reform acts in 2003 and 2016. All important pieces of legislation, the fact that our baronial overlords are getting het up about them suggests that something must be working. As great as this is, there’s still the nagging doubt that the Scottish Parliament and Scottish Government is simply not doing enough. It’s great that we have community empowerment, that estates once controlled by absentee, tax sheltered landlords can be brought into the Common Weal…but,(oh how I despise the introduction of the word ‘but’) here’s the rub, the land is transferred, the previous landlord heads off to whatever sunny, non-inquisitive bolthole he counts his money in and the new landlords, aka the community, suddenly find themselves thrust in a world of business plans, risk assessments, making the books balance, employing specialists, safeguarding the environment, making the land it accessible for all and all on the crypto currency of bawbees. The proverbial Caithness wildcat was unceremoniously chucked in among the tweed clad pigeons earlier this week when Community Land Scotland put out a call for the repopulation of cleared land. The BBC reported this and opened their article for online comments. Soon the page was littered with such banal utterings as; ‘Mugabe land grab’, the ‘envy of class politics’, ‘wind swept moors’ ‘barren mountains’ ‘no access to electricity’ and ‘inaccessible during the winter’. Life is really too short to get involved in some of these internet debates, particularly when you realise that you are as intractable as your typing opponent. What struck me most about the responses was the prevalence of the defeatist attitude, the ‘it’s aye been that way’ diktat of the unimaginative who infest much of civic Scotland, the joyless wee men who didn’t threaten to burst your ball if it landed in their garden, they just silently binned it. It occurs to me that for every solution brought forth on how to normalise Scotland and restore the depopulated lands North and South of the Central Belt, there is an almost coordinated echelon of Naysayers, the type who declaim, “We’ve tried change, it disnae work.” the same dour lot who rebuked Andrew Carnegie, when he donated $10 million to the Scottish Universities for new science and engineering programmes. They’ve aye been with us. We know the multifarious problems associated with repopulating the Highlands. Mountains, moors, weather are not the only difficulties there are a limited amount of jobs going, most of them usually in local government, NHS, education or Environmental charities protecting our wildlife from afar. There’s little in the way of affordable housing, with some traditional croft homes being replaced copybook McMansions hogging the best of views, with lights off for all but a few ‘airbnb’ weeks of the year. There’s the creaking infrastructure; pot holed single track roads ill prepared for the onslaught of North Coast 500 travelers. Carbon-fibre Ferrari super cars are not built to traverse a cattle grid at anything above 15mph. On top of this calumny, a corporate philosophy infuses the land, dictating that such fripperies as banks and post offices are best kept where the majority of the populace live. Both the North and South of Scotland need people, both suffered from the Clearances. People in work pay taxes, taxes take care of infrastructure costs, schools, hospitals, utilities etcetera. Those night time satellite pictures of Scotland bring the problem sharply into focus, the vast majority of us live in the Central Belt. That 100 mile wide and 30 mile deep coast-to-coast strip of land that houses 3.5 million people squeezed into a world of limited space, traffic congestion, an unaffordable housing market, air pollution, poorer health and a precarious jobs market that allows such a thing as zero hours contract to massage the unemployment figures. Brought there by the need of 19th century industrialists for massive workforces in the heavy industries of coal, ship building, iron, steel, and train building. Those jobs have gone and we now exist in the tertiary employment world of service industries, banking, insurance, telecommunications…app development. Having laid out much of the doom and gloom negativity, all that’s left is to explore the possible solutions. Do come back next week as I try to make sense of the complexities around reforestation, the proposed devolution of immigration policy, the small house movement and the intricacies of giving land away for free! You’re a wee bit mixed up on clearances & sporting estates, the Clearances were to make way for sheep, the development at the end of the 1800’s, by Bell’s on the Clyde, of the refrigerated ship led to the importation of cheap frozen lamb from NZ & Oz, ( formerly only raised for wool & had no market,) which brought about the collapse of the Highland sheep industry. Shepherds either became keepers on the new sporting estates or emigrated. The 1880’s gave the crofters security at long last & the imported lamb was ironically produced by the descendants of folk who were evicted in the Highland Clearances! It’s a terrible irony that those cleared would be sending sheep back from the other side of the world. I met some Kiwis last year, whose family had ended up in Waipu, New Zealand. They had gone there via Pictou in Nova Scotia and Adelaide in Australia as Normanites, followers of the fearsome Reverend Norman McLeod. Where actually are you hiding out? I say that as one who spent 28 years on Scoraig and has actually driven a boat past Raspberry Island while visiting my son and daughter in law on Kodiak Island. Very like the Highlands with added bears. Hi Topher, from my eyrie in Assynt I look South to Scoraig. I rally liked the quoted section. “the defeatist attitude, the ‘it’s aye been that way’ diktat of the unimaginative who infest much of civic Scotland, the joyless wee men who didn’t threaten to burst your ball if it landed in their garden, they just silently binned it.” This is symptomatic of the municipal mind-set of many of those who purport to be decision makers. There is a proposal doing the rounds (Graham MacCormick does a lot of the pushing). It postulates the proposition that we need to radically change the way we treat land. Ownership of land should bring with it responsibilities to pay for the infrastructure that is provided to support the use of the land owned; we should pay a tax on all of the land that we own or have beneficial use of. For too long the robber barons have held the land of Scotland; they have used it to the exclusion of everyone else; they charge us at every opportunity. Locally if you want a new driveway you must pay Luss Estates (Colquhoun) for the privilege yet the owners pay no tax on these assets. Make everyone pay for the privilege of having land; transform the finances of our country and encourage those not using land beneficially to sell it to someone who will. Land for housing, for crofting for public use becomes available rather than as now being hoarded by often absentee owners, in housing land-banks and exclusive sporting estates. The clearances continue space, in percentage terms probably just as many cleared in 2017 as 1817. The first land reform bill of 2003 was totally unpicked by the lairds lawyers, hence the need for another in 2016. There are, indeed, an awful lot of us sporting kilts to Highland Games and Burns’ Nights here in the diaspora. We may be embarassing to real Scots, but there’s a good many who’d pack their bags tomorrow if Scotland introduced an Israeli-style right of return. You could probably increase the country’s population by a good 20-25%. Hi Race, I completely agree, a right to return for diaspora; coupled with either a property or business obligation, where you can gain residence by employing a certain number of locals, would hugely benefit our economy and culture. Back in the early 1970s I sat in the heather on the west shore of Loch More in Caithness. Along came Robin Sinclair (the then Lord Thurso). He sat down and I quizzed him about the distant Backlass cottage, at the top of a wee glen leading down to the opposite side of the loch. You could still make out the “green patches” where a bit of land had been worked back in time. The estate-owner told me: “In my grandfather`s time there were 18 families trying to scratch a living out of that bit of glen. There was no way they could survive there”. One by one they moved to the coast. At the time Lord Thurso was campaigning to keep the one teacher school that still existed for the benefit of a dozen children of estate workers. Certainly Scotland`s empty acres could be better used… but we need the help of the best brains to bring about the transformation. It is not simply a case of taking the land back from the “owners”. Taking the land back from the land owners would be a start. The Sinclair’s especially. A planned economy would be a good idea also. In the north Highlands it is a mess. Thirty years ago was shocked at the quantity of empty properties in Caithness & was told “Just try buying one!” There should be heavy fines for leaving properties empty & ruinous, if there’s a demand at all they should be sold at a price fixed by the council. I would add my tuppence worth on the subject of infrastructure which quickly peters out the further you get from the central belt. We are so used to it we think it is normal. It’s not normal – it’s nonsense. We should have relatively high speed electric trains the length and breadth of the country and all trunk roads should be dual carriageway. Then Scotland and those dark places would start to feel more connected. Least liquor estimating camwood try ahead in Scotland, says court. The Holyrood government’s arrangement to present a cover base value to liquor need been sponsored by those scottish courts clinched alongside a decision hailed Eventually Tom’s perusing wellbeing campaigners Likewise denoting “a great day for Scotland’s health”. T636 T4540 T2993 T6897 T1343 T5247 T1823 T5727T637 T4541 T2994 T6898 T1344 T5248 T1824 T5728T638 T4542 T2995 T6899 T1345 T5249 T1825 T5729T639 T4543 T2996 T6900 T1346 T5250 T1826 T5730T640 T4544 T2997 T6901 T1347 T5251 T1827 T5731T641 T4545 T2998 T6902 T1348 T5252 T1828 T5732T642 T4546 T2999 T6903 T1349 T5253 T1829 T5733T643 T4547 T3000 T6904 T1350 T5254 T1830 T5734T644 T4548 T3001 T6905 T1351 T5255 T1831 T5735T645 T4549 T3002 T6906 T1352 T5256 T1832 T5736T646 T4550 T3003 T6907 T1353 T5257 T1833 T5737T647 T4551 T3004 T6908 T1354 T5258 T1834 T5738 Those court for session Previously, edinburgh dismisses a test by Scotland’s drinks industry, which guaranteed those arrangement to set a least value toward 50p for every unit about liquor – An measure that might view a 70cl jug for whisky priced toward An base of £14 – might have been clinched alongside break about european theory. Nicola Sturgeon, the 1st minister, might have been urged on execute her lead arrangement – which might have been initially passed Toward those Holyrood parliament for 2012 with cross-party help – Concerning illustration rapidly Similarly as workable Emulating four a considerable length of time for lawful postponements headed Toward the scotch whisky companionship (SWA). Least liquor estimating camwood try ahead in Scotland, says court. The Holyrood government’s arrangement to present a cover base value to liquor need been sponsored by those scottish courts clinched alongside a decision hailed Eventually Tom’s perusing wellbeing campaigners Likewise denoting “a great day for Scotland’s health”. Those court for session Previously, edinburgh dismisses a test by Scotland’s drinks industry, which guaranteed those arrangement to set a least value toward 50p for every unit about liquor – An measure that might view a 70cl jug for whisky priced toward An base of £14 – might have been clinched alongside break about european theory. Nicola Sturgeon, the 1st minister, might have been urged on execute her lead arrangement – which might have been initially passed Toward those Holyrood parliament for 2012 with cross-party help – Concerning illustration rapidly Similarly as workable Emulating four a considerable length of time for lawful postponements headed Toward the scotch whisky companionship (SWA).